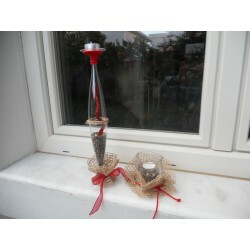 …small utilitarian-decorative objects made by plastic bottles, jars, glasses e.t.c. our surroundings and «relieve» our neighborhood recycling bin!! Group E-PLASTIC There are 3 products. 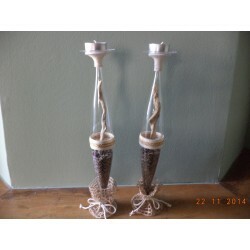 Candle holders from plastic champagne glasses, decorated with white-beige details (laces – strings). Internally they contain fine multi-coloured sea pebbles and sea driftwood in an irregular shape.